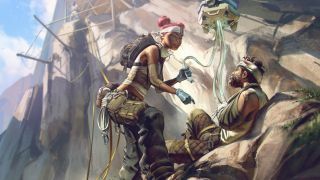 Apex Legends is still flying high after hitting 25 million players in its first week, and its first patch is bringing some welcome bug fixes along with some cosmetic item flourishes to celebrate Valentine's Day. If you want a full collection for your Legends, you should act fast: the "Valentines Days" items go live at 6pm PT today and will only be around until February 19. In a post on the official Reddit, Respawn detailed what changes and items are coming with the patch. The decorative delights include the "Through the Heart" skin for the Longbow sniper rifle and a "Love of the Game" banner frame for everyone's favorite grappling robot, Pathfinder. You can also earn the "Live Die Live" banner badge for reviving a teammate between now and February 19, which you should really be doing anyway when your squad is in a pinch. If you're really eager, maybe one of your squadmates can purposely grenade themselves right off the bat so you can earn your revive reward that much quicker. Respawn also detailed a bunch of fixes that should improve stability for people suffering from constant hitches or crashes whenever they try to play (like yours truly). An exploit that let players duplicate items in their inventory has been removed, and there's been a slight tweak to Bloodhound's ultimate ability. The Kings Canyon map has also had a once-over to patch up any holes in the geometry that let players get stuck or fall through the environment. This is just the first patch of many, and Apex Legends is sure to get plenty more bug fixes, balance tweaks, and new cosmetic items every week. "We still have a lot of work to do," reads the post, "and we hear those frustrated by disconnects and crashes and are working to improve stability and performance as well as provide more visibility for everyone." These Apex Legends tips will turn you and your squadmates into Champion-grade combatants.